Pictured at the grand opening of the US HAEA Hereditary Angioedema Center at UC San Diego are (left to right): Paul Viviano, UC San Diego Health System CEO; Dr. Marc Riedl, Center Clinical Director; Dr. Bruce Zuraw, Center Director; Anthony Castaldo, US HAEA President; Dr. Sandra Christiansen, Center faculty member; Dr. Wolf Dillmann, UC San Diego Department of Medicine Chair; and Dr. David Brenner, UC San Diego Health Sciences Vice Chancellor, UC San Diego School of Medicine Dean. It is rare for an “orphan” disease (typically a condition that affects fewer than 200,000 people nationwide) to have a specific center dedicated to providing treatment and research. And it is even more unusual for big pharmaceutical companies to invest in an endowment to fund this type of center. Fortunately, the US Hereditary Angioedema Association (HAEA), a nonprofit patient advocacy organization, along with four pharmaceutical companies—Shire Human Genetics Therapies Inc., ViroPharma Incorporated (which merged with Shire), Dyax Corp. and CSL Bering—pledged a total of $4.6 million to help make the US HAEA Angioedema Center at UC San Diego Health System a reality. A number of individuals, including those with the disease, also provided private support. The grand opening of the first-ever comprehensive angioedema center in the United States was celebrated Jan. 31. Diverse forms of swelling, known collectively as angioedema, may involve almost any area of the body. During attacks, patients are frequently unable to engage in normal life activities; the attacks could even be life threatening. What triggers the swelling is largely unknown. During his search for relief and care for the disease, Castaldo met Dr. Bruce Zuraw, UC San Diego professor of medicine, who offered hope. 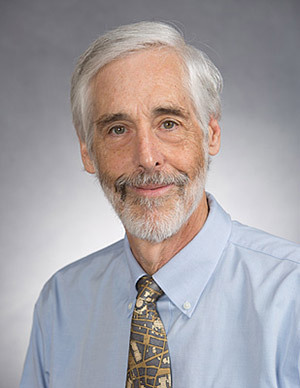 Today, Zuraw is the center’s director and inaugural recipient of the U.S. HAEA Endowed Chair at UC San Diego. From research in genetics to the most advanced treatments, the center’s unique “bench-to-bedside” approach is at the forefront of personalized angioedema medical care. “With our research and clinical expertise and partnership with the U.S. Hereditary Angioedema Association, we can improve patients’ lives, save lives and ultimately find a cure,” said Dr. Zuraw. Besides helping patients get properly diagnosed as early as possible, a driving factor for establishing the center is to consolidate the expertise now needed to navigate rapidly evolving treatment options for the disease. Children of an affected parent have a 50 percent chance of inheriting the disease and hereditary angioedema is thought to impact one person in 50,000, suggesting that there are more than 6,000 affected individuals in the U.S. Because the disease is so rare, people with the condition often go undiagnosed or misdiagnosed for years. 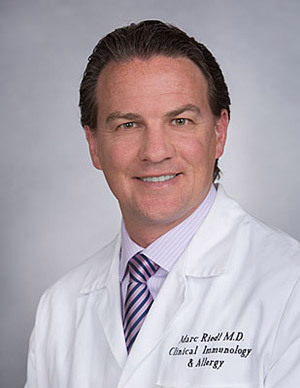 “The disease may be misdiagnosed as a food or medication allergy, a bowel disorder or a gynecological condition, leading to unnecessary surgeries or even death if a patient has a swelling attack in the throat,” explained Dr. Marc Riedl, associate professor of medicine and the center’s clinical director. The new US HAEA Angioedema Center is located at 8899 University Center Lane in University Towne Center. Additional private support is needed to ensure treatment and a possible cure for those suffering from angioedema. Donors are encouraged to make a gift online.